A new Bluetooth headset lets users record video and stream it live to their smartphones. Ever see something you wish you had on film? Say, a miraculous home-run in the ninth, or your baby’s first steps? 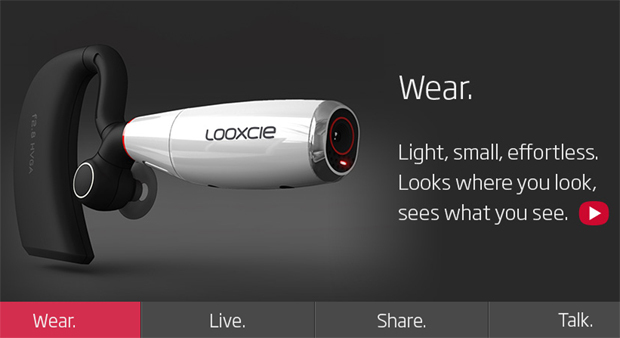 A new wearable camcorder called Looxcie (look-see) aims to capture all these shooting-star moments. Looxcie ($199) is a Bluetooth headset that features video recording–but no record button. Rather, the device is designed to constantly capture video, which can either be viewed live on one’s smartphone, or saved to memory if a YouTube-worthy event occurs. Like any Bluetooth headset, Looxcie fits snugly around one’s ear (it’s a bit heavy), and can make and receive calls. But since the device is constantly on and recording to a temporary storage buffer, one must only hit the “Instant Clip” button, and the last 30-seconds of footage is automatically saved to your Android, and soon BlackBerry and iPhone. What you see is what you record. What’s more, using the Looxcie app, video clips can be instantly shared via email, Facebook, YouTube, or Twitter. It’s the camcorder for the social media age–a device that captures tweet-size video which can immediately be uploaded online. And in case the last 30 seconds wasn’t enough, users can always grab up to the last hour of footage through using the Looxcie app. Though many smartphones have video recording, they’re often sitting in your pocket. It is Looxcie’s TiVo-esque playback feature that won’t let you miss a moment (think: Sully landing the plane on Hudson—or, yes, the undeniable naughty home movie applications). Of course, there’s always the issue of style. Capturing video of your baby’s first steps with Looxcie means you’re probably wearing a Bluetooth headset during your baby’s first steps. It means you’re probably the kind of person who wears a Bluetooth headset around-the-clock. But if you’re comfortable or shameless enough to wear one in public, why not add a camcorder? Who knows what you might see.